Though it certainly helps, a well-groomed yard does not necessarily equate to a fire-resistant landscape. 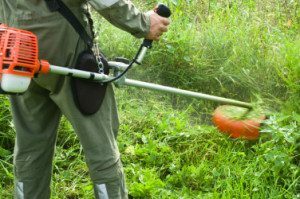 While having ample space and maintaining regular upkeep do help, there are other measures designed to specifically address issues related to fire abatement when it comes to landscaping. In fact, certain types of plants are known to be fire-resistant, which can go a long toward improving the safety of a landscape. Plants and brush that pose a fire hazard can be particularly dangerous in the drier spring and summer months, even more so now with the drought that’s affected all of California (click here for more information from California Fire Safe Council). What may seem like a little bit of excessive growth or brush can quickly turn into something much more dangerous. You may even receive a notice from the city in which you live, telling you to address the issue as it can affect other nearby properties and homes. Are you prepared to deal with the potential of fire damage to your trees and property? This guide from Ready For Wildfire details some of the more important factors to consider when assessing the possibility of fire danger. At Lewis Tree Service, we have an experienced staff with more than 20 years of expertise in caring for lawns, trees and plants, including a specialization in fire safety precautions. Whether you need simple pruning and upkeep, advice on fire safety practices, or a complete reconfiguration of your landscape, we’re there to handle the job affordable and effectively to give you the peace of mind that comes with a beautiful and safe yard. Have fire concerns related to your yard or landscape? Call us today at (831) 508-8995 to learn how we can help! We offer FREE cost estimates to all customers and are happy to answer you questions and provide guidance when needed!